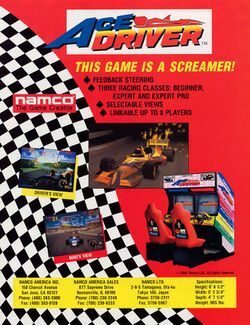 Ace Driver is a racing arcade game that was released by Namco in 1994; it runs on that company's System 22 hardware, and like Final Lap, Four Trax, and Ridge Racer before it, it allowed up to eight players to play simultaneously when four two-player cabinets were linked together (Players 1 & 2 on "Team Red Lightning", 3 & 4 on "Team Blue Castle", 5 & 6 on "Team Yellow Cyclone", and 7 & 8 on "Team Green Island"). As with the aforementioned Ridge Racer the cars are also covered in names and characters from earlier Namco games - and the track itself also features advertisements for the aforementioned Four Trax (as well as ones for Driver's Eyes and Solvalou). Similar to Winning Run, the players must also choose between two types of transmission (automatic and manual) and three types of racing class (beginner, expert and expert "pro") at the start of the game; however, the third type of class can only be played when all the players (regardless of how many there are) choose it. As in most of the other Namco racing games, the players must complete a specific number of track laps (determined by how the cabinet's set up) before the timer runs out, and for each track lap they complete, they will receive extra time in which to complete the next track lap - however, if the timer should run out for any player they will be eliminated from the race and it will continue without them. This is the first title in the Ace Driver series; it was followed by two sequels: Ace Driver: Victory Lap (1995), which featured three different courses (and calculated each player's points over them), and Final Turn: Ace Driver 3 (2008) which was a remake of this game and ran on Namco N2 hardware. This page was last edited on 24 January 2016, at 12:00.